During the fifteenth and sixteenth century, it was customary for inventories of possessions to be taken from time to time: generally at a person’s death, but often, for noble or royal households, during life, particularly when changing residence. Some twenty-two inventories were taken of Marguerite’s possessions, from the first in 1493, to the last, taken in 1531, after her death. Not all survive, but those of 1483, 1516, and 1523/4 do. 7. 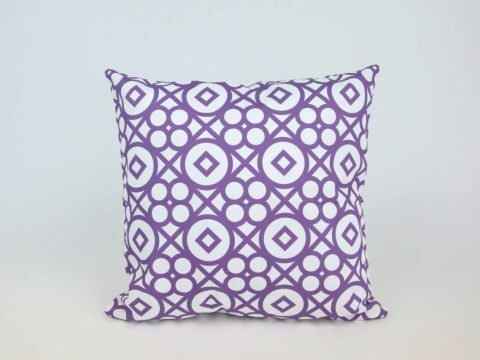 Inventory of tapestries – 1516? 11. Inventory of small items – jewels, textiles and plate – 1520? 12. Inventory of napery and other fabrics – 1520? 13. Inventory of napery and other Spanish fabrics – 1520? 14. Inventory of white goods – 1521? Unlike most of the other inventories, most of Marguerite’s contain a level of detail, and sometimes personal comment (fort anticque, and de bien bonne main are two comments) that suggest that for her, collection of beautiful objects had a personal relevance, beyond the usual requirement of amassing wealth and beauty for the purpose of displaying power. Her gold and silver items were not just recorded by the weight of bullion, but are described in detail, often with the artist’s name included. Amongst the artists who worked for her were Bernard Orly, Pietro Torregiano (who carved the tomb of Henry VII and Elizabeth of York at Westminster Abbey) and Hans Memling. Marguerite’s predecessors in Burgundy, such as Philip the Good, and his duchess Margarethe of Bavaria, were collectors and patrons of art of all types in the mid-fifteenth century, patronising Jan van Eyck and Rogier van der Weyden, although Philip’s first love was tapestry. This taste for collection was taken up with gusto by Philip’s daughter-in-law, Margaret of York, duchess to Charles the Bold, who collected a vast number of books, tapestries and other objets d’art. Marguerite was strongly influenced by Margaret, but seems to have developed her own preference for painting. She amassed a vast collection, particularly in the new field of secular portraiture. By the end of her life, Marguerite probably had almost 100 paintings - the inventory of 1523/4 identifies eighty portraits in her collection, as well as six devotional diptychs or triptychs in which portraits of herself or other members of the family are included. After that date, her court painter, Jan Corneliusz Vermeyn, appointed in 1525, produced more works, many of them from life, as he was sent by Marguerite to her various relatives to take make his portraits as close to life as possible – a point on which she dwelt in various commissions. Before this period, verisimilitude had not previously been a particularly important element of portraiture, but we can conclude that works at least by Vermeyn, are real likenesses. Since she commissioned her portrait from Bernard van Orly to be her official likeness, we can believe that this is what Marguerite really looked like. This official portrait was copied with variations, for distribution at home and abroad, including to foreign rulers. Henry VIII received a copy. Much of Marguerite’s collection was displayed in the ‘Première Chambre’ of her palace, the Hof van Savoye at Mechelen. It was decorated with hangings of blue and yellow taffeta, which formed a backdrop to the paintings, some of which also had curtains. The room contained two religious works, and thirty portraits of Marguerite’s family and other rulers. 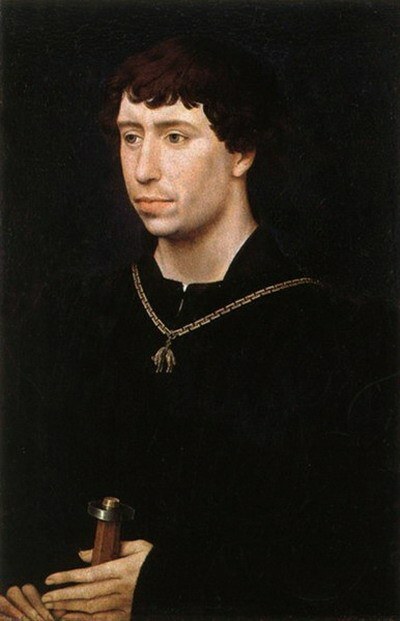 Having pride of place amongst the collection were the paintings of Marguerite’s maternal Burgundian ancestors – John the Fearless by an unknown artist, and his son and grandson, Philip the Good and Charles the Bold, both the latter wearing their collars of the Golden Fleece, painted by Rogier van der Weyden. Philip the Good’s third wife, Isabella of Portugal, who was Marguerite’s great-grandmother, was also present, as well as an illegitimate daughter of Philip’s, Mme de Charny. Her brother Philip the Fair, Duke of Burgundy was painted (after his death) in a commission from Marguerite to Pieter von Coninxloo in 1513. He had already painted a double portrait of the siblings, perhaps for the marriage negotiations with Spain. A painting of Marguerite’s second husband, Philibert II of Savoy, was a New Year’s gift. 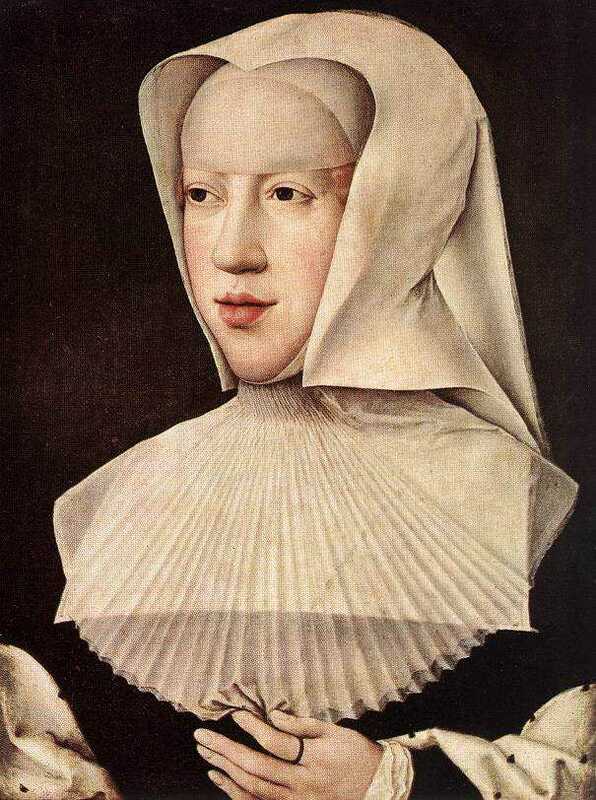 Katharine of AragonMarguerite’s paternal ancestors were less well-represented in the Première Chambre, although she had a picture of her father, Maximilian, there, and two others displayed elsewhere. Marguerite’s father sent her a painting of his mother, Eleanor of Portugal, in 1512 but its whereabouts is unclear. Also in this most important gallery, were portraits of some of Marguerite’s nieces and nephews – HRE Charles V (two pictures), Ferdinand, King of Hungary & Bohemia (later HRE Ferdinand I); Archduchess Eleonora, Queen of Portugal, and later, after Marguerite’s diplomatic coup, the Ladies’ Peace, Queen of France; and Archduchess Mary, Queen of Hungary, and Marguerite’s successor as regent. Archduchess Isabella, Queen of Denmark was not present, but her husband, King Christian of Denmark did appear. 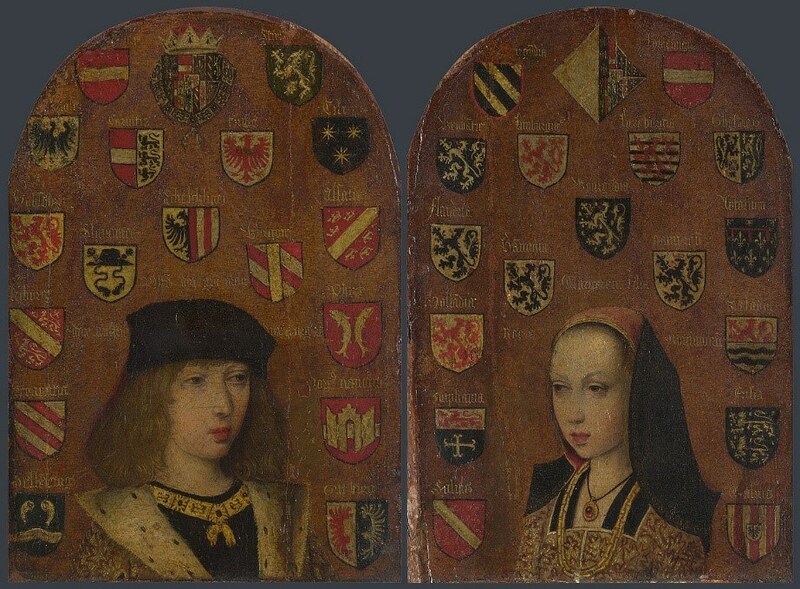 Moving further into Marguerite’s extended family, there were portraits of her parents-in-law, Ferdinand of Aragon (two) and Isabella of Castile, their eldest daughter, Isabella, Queen of Portugal, and their youngest Katharine (Catalina) of Aragon, Queen of England. Their son, Marguerite’s first husband, Prince Juan, appears only in a diptych, alongside Marguerite herself, that she kept in her private study. A portrait of another sister, Juana, Queen of Castile, who was also the wife of Marguerite’s brother, Philip, was hung in the library. Not so closely connected by blood or marriage, but political allies, who therefore merited inclusion in the collection, were Henry VII of England, wearing his Order of the Golden Fleece, and his son, Henry VIII. The painting of Henry VII was by Michel Sittow. The sitter is holding a carnation – generally the symbol of a marriage portrait, so it probably relates to Henry’s desire to marry Marguerite, enthusiastically promoted by her brother, Philip. Other English portraits were of the daughter of Henry VII, Mary, who was married by proxy to Marguerite’s nephew, Charles, from 1508 to 1514, and the second Mary Tudor, daughter of Henry VIII, who was also betrothed to Charles from 1522 to 1526. Neither marriage took place. Henry VIII himself was hung (not literally, although some people might have been tempted) in Marguerite’s library. Over time, more portraits were added to Marguerite’s collection – the wife of Charles V, Isabella of Portugal, three of the children of Christian and Isabella of Denmark; four of Ferdinand I’s brood of thirteen were represented, and three portraits of Charles’ illegitimate daughter, Margaret, later Duchess of Parma, and a successor of Marguerite as regent. This extraordinary collection reflected Marguerite’s wealth, her importance within the familial and political network of European rulers, and her personal tastes.